A valid email account is required to register. You may register by clicking on 'User Menu' > 'Register' and filling out the form details. Once you have completed the registration form, an automated response will be mailed to your submitted email account with activation details. After you have received the email you may activate the account by clicking on the activation link within the received email. If you prefer to cut and paste the activation link into your browser address field please ensure you copy the entire link. In some cases the link parameters may extend beyond a full text line. Once you have activated your account you may login. Control Panel Options in the right column appear. One of these options is "Manage your business listing”. Selecting this option will allow you to Add a New Listing. An added option also will allow you to submit a request to "own" an existing listing. The listing options range in price from FREE to R142.50 per month. Click on the options below for more information on the different listing types available. Sponsored listings guarantee top of the pile display in search results. Sponsored Listings are allocated a higher search result priority than Gold, Silver, Bronze and Free listings, and will appear at the top of the results page for the chosen area and category. NB: A pre-requisite for purchase of a Sponsored Listing is AN ALREADY existing Gold or Silver Listing. Gold Listings (Premium Portfolio Listings) provide an opportunity to create a single page website within the Gardenroute.com Business Portal. Gold Listings are given preference over Silver, Bronze and Free listings in all search results and includes all of the features and functions listed below, as well as a logo and up to 12 images. The price includes annual hosting and initial setup of the page. Please email us your request and we will notify you of payment details and other requirements. 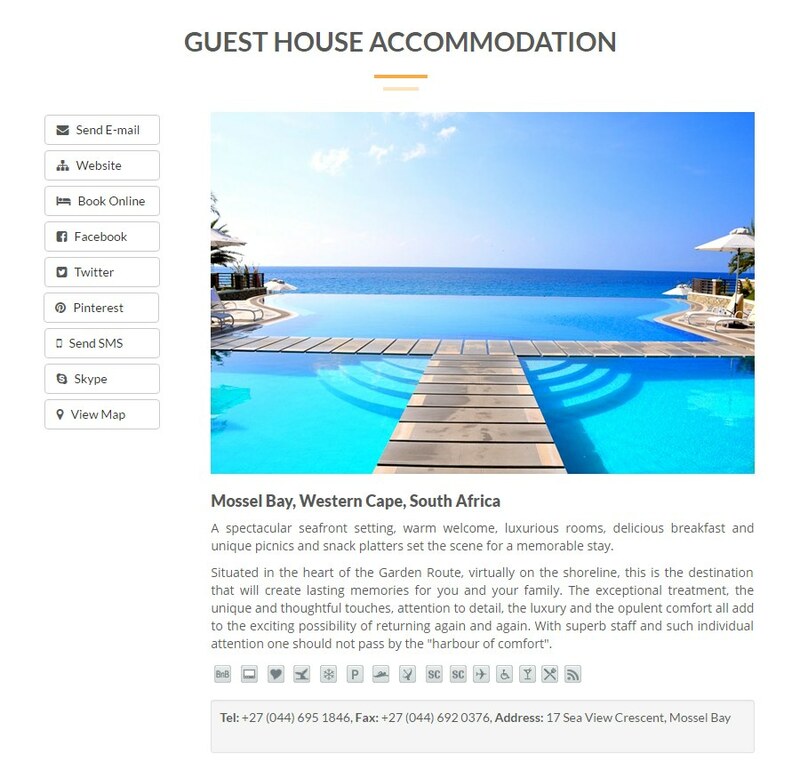 Advertorial listings provide exposure through publication of a supplied and approved advertorial article linked from our Portal’s main menu, plus creation of a single page website within the Gardenroute.com Business Portal (Gold Listing). It is given preference over Silver, Bronze and Free listings in all search results. NB: The Advertorial Listing includes the creation of a Gold Listing. In addition to the menu link to the article, the Gold listing option includes front page banner exposure. The Advertorial Listing is allocated a Gold Listing result priority, which is higher than Silver, Bronze and Free listings. Silver listings (Business Partner Links) are given preference over Bronze and Free listings in all search results. Bronze listings (Web Links) are given preference over Free listings in all search results. Free listings appear AFTER paid listings i.e. Sponsored, Gold, Silver and Bronze listings in all search results, and do not have access to facility icons. All listings include an image and links for: more information, website, email, Google map, Skype, Facebook, Twitter and Nightsbridge bookings. Accommodation establishments have the additional option of adding icons to indicate availability of facilities and amenities. You may upgrade to another type of listing at any stage.